You are here: Home / Cocktails / Lemon Vodka Slush – The Best Summer Cocktail Recipe Ever! Summer is the best time of the year, don’t you think? With long sunshine-filled days, fun BBQs with yummy eats and beautiful sunsets at the beach that you wish would never end. 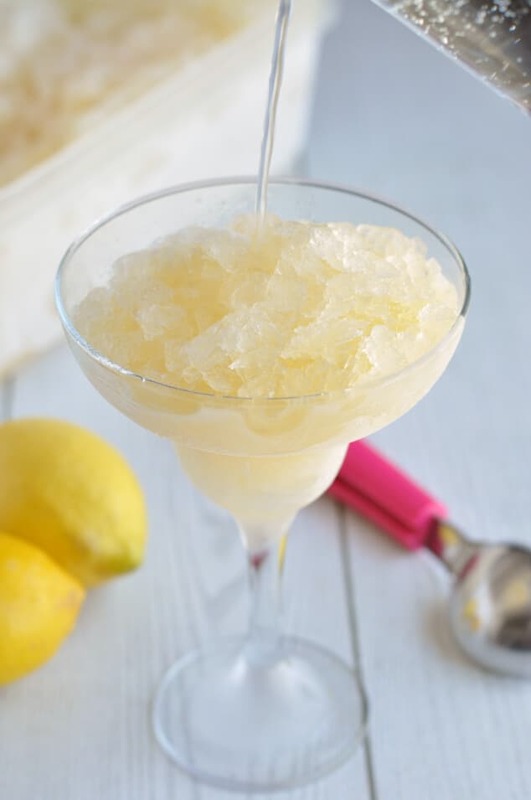 Such an amazing season deserves to be celebrated with an awesome cocktail, which is exactly where this lemon vodka slush comes in! It’s my favorite summer cocktail recipe of all-time and it’s something I genuinely look forward to every single year. This cocktail is packed with exotic fruit juices, tart citrus flavors and a good kick of vodka. Not to mention the incredibly addictive frosty texture you won’t be able to get enough of. 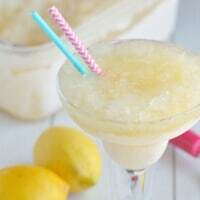 Nothing says summer more than a great big frosty glass full of lemon vodka slush. Especially if you’re sipping it at the beach or by the pool. Ever since I first came across a recipe for lemon vodka slush years ago, I’ve been trying my hardest to perfect it and… I’ve finally done it! One thing you need to know before you make the best cocktail you’ll ever have: this lemon vodka slush is really moreish and although it’s got a lot of alcohol in, you really can’t taste it. Aside from the amazing flavor, one of the best things about this recipe is how simple it is to make. Throw all the ingredients into a big plastic container, freeze, scoop and top with Sprite, 7Up or sparkling water. That’s all there is to it. If you use sugar and ordinary Sprite or 7Up to make this recipe, 1 glass will come in at 320 calories. If you want to reduce that down to just 180 calories per glass (that’s almost half!) without sacrificing any of the flavor or alcohol, listen up. Swap the sugar for artificial sweetener. I can’t give you an exact quantity because different types of sweetener have different levels of sweetness. One of the little sweetener pill-type things I use at home is the equivalent to 1 teaspoon of sugar. There are 48 teaspoons in 1 cup and 3 cups of sugar in this recipe. So that makes 144 individual sweetener pills. All the other flavors in this lemon vodka slush really mask the artificial sweetener taste. So using a zero-calorie sweetener is a great way to massively cut down on calories. Use Sprite Zero, Diet 7Up or sparkling water. Another great way is to swap ordinary Sprite/7Up with the zero-calorie diet versions. This way you get the same taste without the calories. I think the artificial sweetener and natural sweetness from the fruit juices is more than enough for this cocktail, so I’m happy with sparkling water. But if you love really sweet cocktails, try one of the diet sodas instead. Don’t use Stevia. Stevia has a really strong taste and it will overpower all the other flavors in this summer cocktail. So unless you’re a total Stevia-holic, stick to a mild-flavored artificial sweetener. You don’t need any unusual ingredients to make this summer cocktail. But you will need a seriously big freezer-safe plastic container because this recipe makes a lot of lemon vodka slush. You could make a half batch, but where’s the fun in that? A 29-cup container will just about do the trick. The volume of water hugely reduces during the boiling process, so the container won’t be full to the brim. Containers this big are hard to find, but you can easily pick one up online. This is the container I use. It’s super sturdy and you’ll be able to use it to make lemon vodka slush for years and years! While you’re at it, you’ll want to get a solid ice cream scoop to help you scoop out all the slushy goodness, too. This stuff can be quite hard when it freezes and you don’t want to end up bending all your spoons. 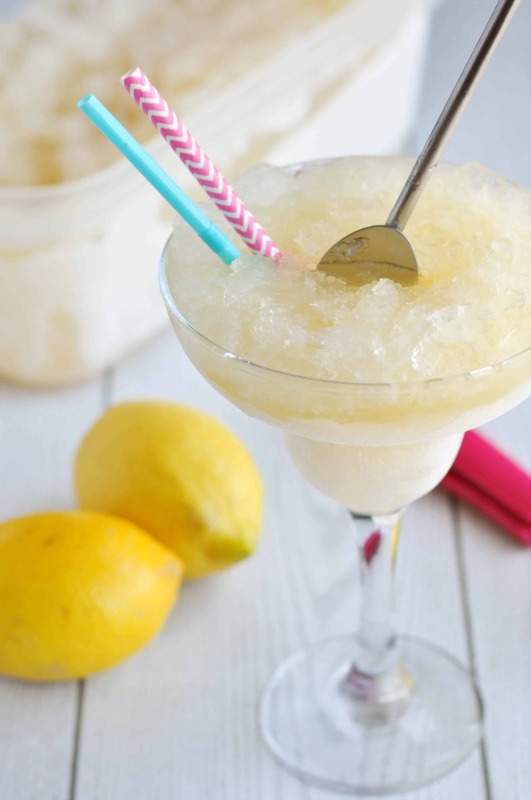 If you love frozen summer cocktails like this lemon vodka slush, you’ve absolutely got to try my strawberry vodka slush! It’s a simpler version of this cocktail, made with fewer ingredients and a sweet strawberry hit. Oh, and make sure you save this vodka cranberry slush on Pinterest or in your bookmarks, so you can enjoy festive slushy cocktails when Christmas comes around. Want an amazing new cocktail recipe to try for every week of the year? Then you need my ebook – A Year of Cocktails: 52 Sensational Drinks for Sipping Throughout The Seasons! The book is on sale for $4.49, but if you sign up for my newsletter, I’ll send you an exclusive discount code for 55% off. That means you’ll get 52 fabulous cocktail recipes for just $2! 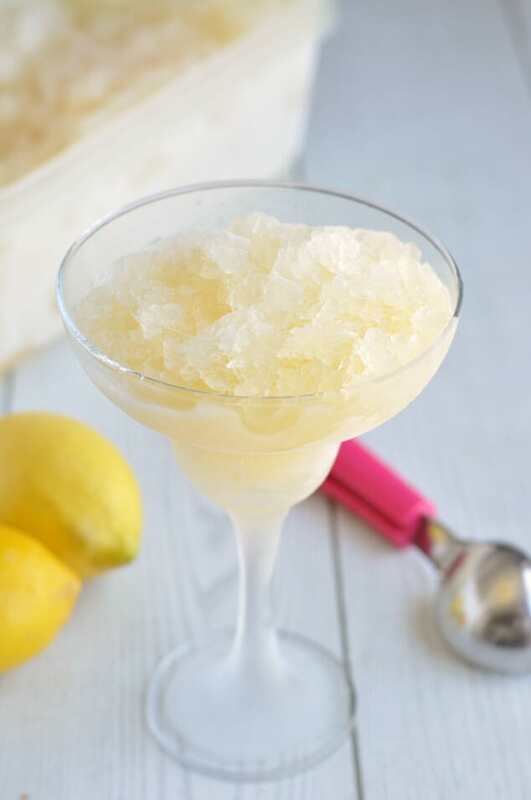 Cool, refreshing and loaded with alcohol, this lemon vodka slush is going to be your favourite summer cocktail of all time after you've had just one delicious sip! In a large saucepan over a high heat, stir together the water and granulated sugar or artificial sweetener. Bring to a boil and then reduce the heat down to medium-low. Leave to bubble for 10 minutes, until the sugar/sweetener has completely dissolved. Pour the simple syrup into 29-cup plastic freezer-safe container. Leave to cool to room temperature for around 30 minutes. When the simple syrup has cooled, stir in the rest of the ingredients (pineapple juice, vodka, lemon juice, grapefruit juice and 4 cups of Sprite/7Up/sparkling water). Place the container in the freezer for at least 24 hours to set. When you're ready to serve, use an ice cream scoop to scoop out enough of the lemon vodka slush to fill a glass and pour over extra Sprite/7Up until it reaches the rim. Mix the drink with a straw or spoon to make it slushy then serve immediately. 1 glass is 180 calories if you use zero-calorie artificial sweetener and zero-calorie Sprite/7Up/sparkling water. I’ve just found my new favorite libation. It looks delicious! Uhmmmmmm YUM!!! This sounds amazing!! All the different fruit flavors sound like they would go deliciously together! I love the sound of this, can’t wait to try it! Yummmmm!! This just may be my new favorite drink….thanks for sharing! Pinned! I will definitely have to try this (with an non-refined sugar option)! Wow! Looks delicious! I will be trying this one! Ooh yum! Can’t wait to try! Pinning. Oh yeah!! This looks perfect for my summer deck drink! My husband will LOVE this!!! Is it just me or when do you add the grapefruit juice? It’s not listed in the recipe. How did you make it? You get grapefruit juice just like you’d get lemon or orange juice – by cutting the fruit in half and squeezing. I hope this helps! wow this sounds so delicious! I will probably be keeping this in my freezer on a constant basis this summer! Yumm! Thanks for sharing the recipe at Monday Funday! Oh my! I’ll be featuring this on Facebook today! Thanks for linking up at the Wildly Original Party over at I Gotta Create! 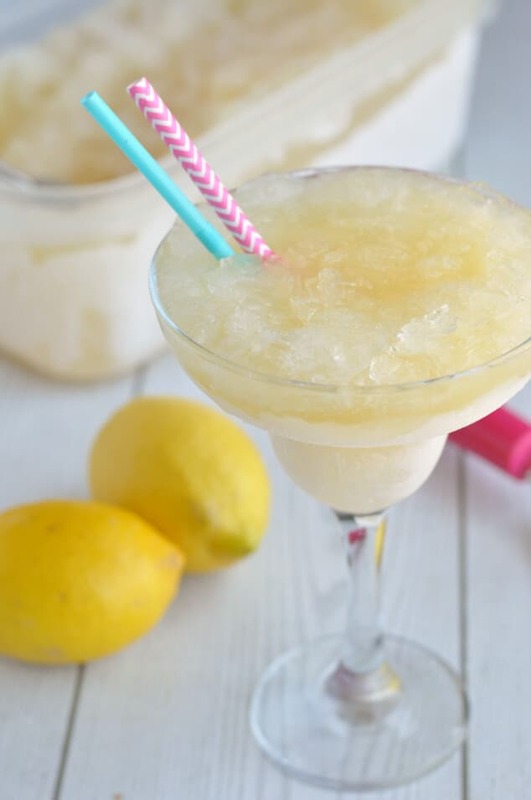 Oh my…I caught a glimpse of this recipe as I scrolled down your post on granola bars..I’m definitely pinning this one…come on sunshine, come on “Lemon Vodka Slush!”. This reminds me of the lemon slushes my aunt used to make…of course this one’s got a kick! Look delish! This sounds like only the BEST THING EVER!! I am definitely going to be making this. I LOVE lemon and this is perfect for summer parties! Thanks for sharing. Sounds fresh and a great way to cool down. Thanks for linking up to Sweet and Savoury Sunday, stop by and link up again. Have a great day!! Sounds fantastic especially on a warm day like today! Thank, Louise. It really is perfect for summer weather! Thanks, Elaine. I hope you enjoy it! Wow, this sounds good and perfect for hot days! Thanks so much, Jennifer! I’ll be sure to check your party out. Thanks so much, Tianna. I’m glad you liked it! Yum. Yum yum yum yum yum. I was just telling my husband I wanted to make another bourbon slush. This sounds even more awesome!!! Can’t wait to try it! Thanks for linking up!! I’ve used recipe similar to this for years only mine is Lime Vodka Slush, minus the grapefruit juice. It’s Amazing! I LOVE lime – even more so than lemon! I think you’ve just inspired me to make a lime version, PJ – thanks! 4 cups lemonade (such as Sprite or 7Up) + extra for mixing – which are really two different things. Do you recommend lemonade or lemon/lime soda? Can’t wait to make this for our upcoming trip to the lake! Hi Aubie. Thanks so much for visiting! Why didn’t I see this before the hot weekend we had 🙁 I would have loved to eat this for refreshment! Think it would fit a BBQ party perfectly! I am one who has to watch my sugar, but this sounds amazing!! Any hints or suggestions? Hi Chris! I’ve just done some research online and found you can make a simple syrup (which is basically what the sugar and water is in this recipe) using artificial sweetener! So if you could get your hands on 3 cups of stevia powder, you could use it to replace the sugar in this recipe. Stevia and sugar are not to be equaled, stevia is sweeter than sugar! Can’t drink grapefruit juice. Could I substitute orange juice instead or any other juice? Maybe lime juice….Thanks. Hi Paula! Good thinking with the lime juice, but I think it might make it a bit too tart. To substitute the 2 cups of grapefruit juice, try 1/2 cup lime juice and 1 1/2 cups of orange juice. This way you should still have the slightly tart taste that grapefruit gives, but it won’t be too much. It sounds similar to one my mom used to make, I am going to make up a batch for a surprise! A great summer, hot weather drink. The recipe says 4 cups lemonade & then says sprite / seven up. What am I missing? Hi! Quick question. Does the 4 cups of sparkling soda (lemonade/Sprite/etc) go in the freezer with the frozen mix? Or is it just for topping? Never heard of freezing carbonated drinks like that. I added up all the quantities in the recipe and wonder how it would fit in a 17 cup container ? Making the slush right now!! Curious what type of lemonade everyone uses to mix with the slush?? I like simply lemonade but what others are good?? Sounds wonderfully refreshing. Just wondered what was meant by the extra 7up or Sprite for mixing? Sounds very refreshing. I was just wondering what was meant my adding extra 7up or sprite for mixing? When I saw this recipe it brought back memories from the 80’s. My mom’s friend always made this in the summertime. It’s amazing and I’ve had it blueberry style! Thank you for posting. I will surely be making this soon!! A blueberry version sounds amazing, Tammy! I’m so going to have to try that. I found this recipe last summer after moving to Arizona. I am now about to make my third batch, also without grapefruit juice. I just add extra lemon. I didn’t think about adding like juice. I keep a supply of simple syrup on hand for cocktails, so do you think 4 cups would be sufficient? Lastly, I tried blindly in fresh strawberries before serving and it was delicious, so now they are just going into the mix! What an amazing idea to blend in fresh strawberries, Shawn! I’m definitely going to give that a try myself! If you’re using simple syrup you’ve already made, I think 4 cups would be the perfect amount. I’m so happy you like my recipe and hope it keeps you cool in the scorching Arizona heat! This recipes sounds amazing ??? ?